The patented Turf Drain Siphon System™ is the first drainage system where you can install drainage without the need to grade pipe. Piping can go over mounding or into an ungraded trench. It has application in flat coastal properties where there is a need to take the water a long distance with little elevation change. Any property where grading pipe may be difficult, such as rocky property or a course with lots of underground obstructions, can benefit from a Turf Drain Siphon System. The photo at right shows a siphon basin during installation. 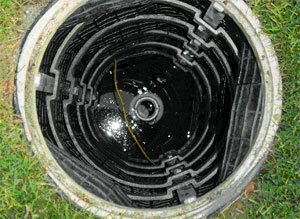 Note that the piping leaves the drainage pit at an elevation higher than the depth at which the water will be collected in the bottom of the basin. 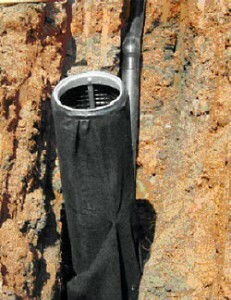 In the photo below, the siphon basin during operation has siphoned water all of the way to the bottom of basin.